I had the good fortune to borrow and test Novak Djokovic’s actual racquet last week. The pro stock name for it is the PT113B and it is one of the most elusive frames on the pro stock market. Is it as good as it is rare? Read on to find out. It is good to point out that this was Novak Djokovic’s actual racquet before he moved over to his slightly new version earlier this year. The new racquet has an 18×19 string pattern instead of the old 18×20, extended length of 27,25 inches instead of 27 and a slightly lighter weight. I would also guess it is slightly stiffer for him to be able to get more free power. The racquet I borrowed had the owner’s specs on it and not Novak’s (the owner has a couple of these racquets and actually uses them!). This being: 340 grams and 32 cm balance strung with a hybrid of natural gut at 25 kg and Luxilon 4g at 24 kg. Djokovic is using Alu Power Rough instead of the 4G in the crosses and strings it higher at 27/28 depending on the conditions. You can find out Djokovic’s old racquet specs here. 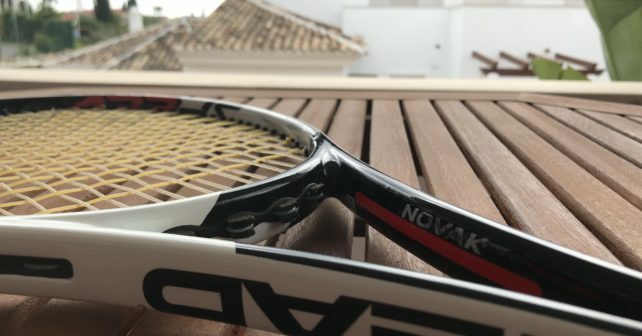 Novak Djokovic’s Actual Racquet – How does it play? The PT113BTT as I think it is called, plays similar to the HEAD Liquidmetal Radical Tour that Djokovic used in his younger days and I myself use nowadays. It has pin-point control and a nice feel, the difference perhaps being that Novak’s pro stock PT113B is more flexible. 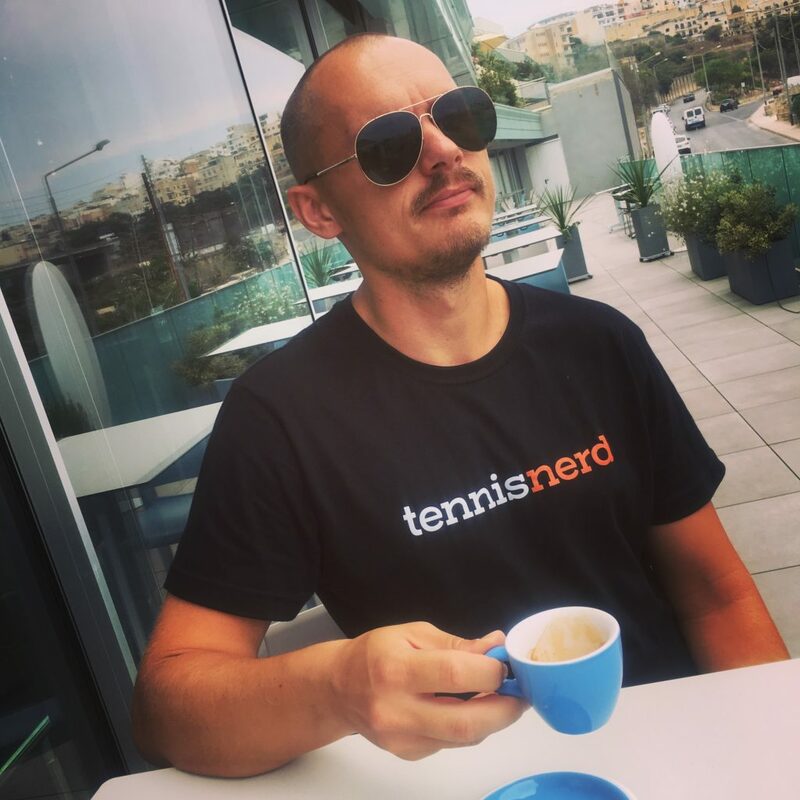 You really feel the ball sink in to the string bed when hitting with his racquet, while the response is slightly stiffer with the Radical Tour. I would say the Radical Tour is a little easier to use thanks to the slight increase in power, but Novak’s PT113B has a better feel. 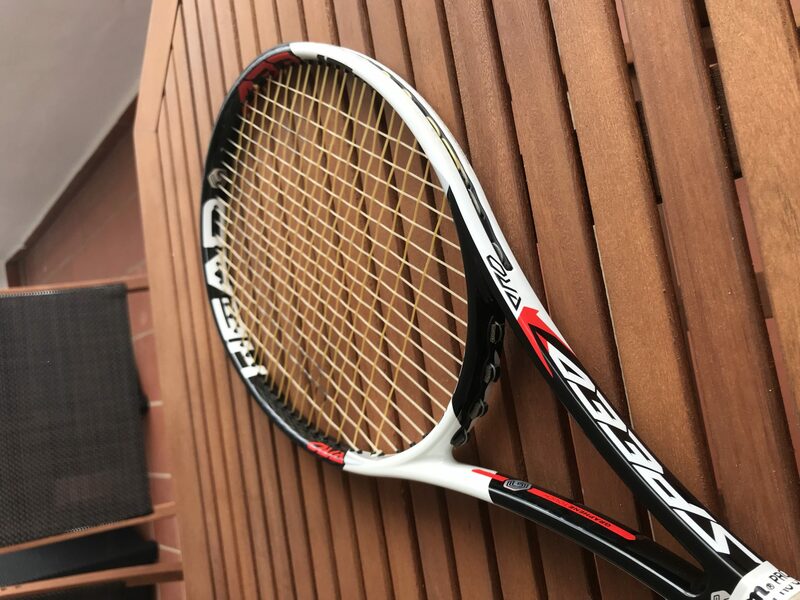 I would probably have added some lead tape to get it up to my preferred spec while increasing the power a bit, but it was still a joy to play with this racquet. I now understand why so many players and collectors want to get their hands on a PT113B. The mold is also used in various iterations by players such as Mischa Zverev (16×19) and Fernando Verdasco. There are probably more players using this frame, but it is not nearly as popular as for example the PT57A or TGT 292.3 (HEAD IG Prestige MP mold). Novak Djokovic’s Actual Racquet – Is it worth it? So unless you are a collector or a racquet purist of the most specific kind, I would say your tennis will be fine also without the PT113B. But I am for sure glad I got to try one, because it was a really nice experience for a tennis nerd. The footage from this play-test is coming soon! Talking about tennis nerds. There are still some t-shirts left if you feel like donating 25 euro or more for the life of this humble website. I’m always scouting about for these flexies, rarely find grip 2s and 1s well they’re non existent! Head and their interchangeable pallets make it easier. Excellent info as always, much appreciated. Yeah, smaller grip sizes might be hard to find sometimes, but I agree, pallets make everything easier. Thanks! I own Verdasco’s pt113B. with his set up, power was too low for me. (strung wt at 342 g.) I have to lead up 2 layers at 3 and 9. ( 4.5 g each side)and 1.5 g at 12 and change to leather grip. It end up at 359 g and play a lot more powerful and stable. But swing wt of my set up is not as high as Djoker set up. I personally feel that the flex racket always need ton of lead tape to shine its real aura. You are so lucky to hit with these! Question: I’ve heard rumors that the PT113B is twin tube. Is this true? And you find it even flexier than the PT57A? Cool article. These are among some of the most difficult stocks to find out there. I saw Djokovic up close training at Wimbledon before the final this summer and those Speeds look great. The paint job is excellent. Slightly prefer the new 2018 PJ though. Would love to try one of these pro stock racquets just to see how different they are to regular retail racquets. Always been a big fan of Djokovic. At his best he’s arguably the best of the ‘big three’ but the least popular or likely to get the recognition. So when he’s up against Federer or Nadal in a grand slam semi final or final he’s easy to root for as the underdog. I have not been a big fan to be honest, but my level of respect for his game is huge. Yesm sometimes I am lucky 🙂 Yes, should be Twin tube. I did not find it flexier than the PT57A, just a more even flex to the string bed that gave me the impression of a bigger sweet spot. So I would say the PT113B is easier to use than the PT57A. That is a nice find! I can understand the power was low, he basically belts his balls at his opponent (and his towels at his ball boys). Between 350-360 is my go-to spec with a relatively head light balance so I can see how that plays really nice. And I agree that a flexy racquet needs some help with weight up in the hoop. But I prefer that from racquet stiffness. Enjoyed your review! I have a few old TGK 238.1 pro stock frames. I was told by Roman Prokes (from whom I purchased them) they were made in Austria. I see there’s one poster on TT who insists they’re made in China. I see you have some TGK pro stock frames of Cilic. Do you know where they’re made? 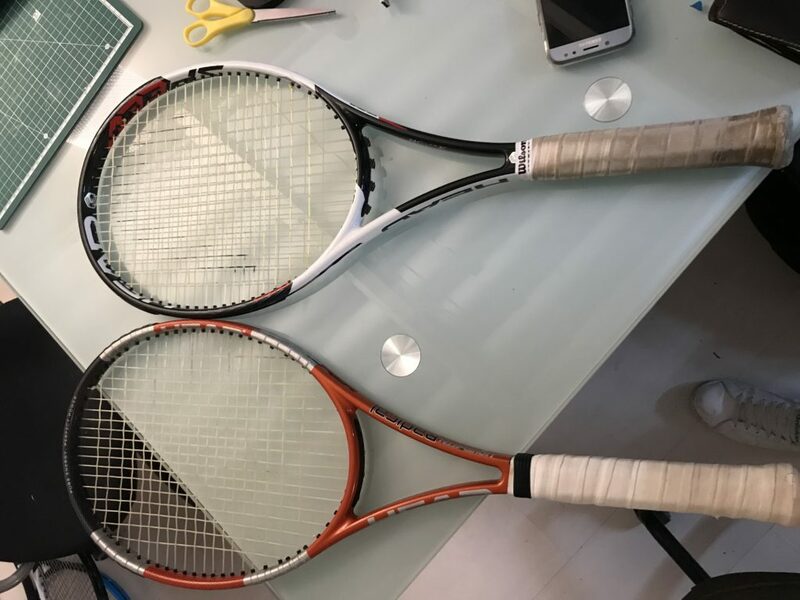 I enjoy your post and found the latest “do I need a new racket” interesting. Currently I play the Head IG MP. But I only have 3 frames. My question is one that you did not touch on. How do I tell if I am wearing the frames out? Is there a number of restringing a racket can take. Number of hours of solid hitting. Thanks. The TGK should be made in Austria and TGT in China. So if Roman says it is from Austria, I am pretty sure they are from Austria. Good point! It takes a LONG time before a frame starts breaking down. What happens is that it will probably play “softer” which is usually a good thing. Del Potro used the same k-Factor paint job racquets for many years due to the feel (and maybe superstition) and they lasted a long time. Consider that he is a pro that plays many hours every day and strings the racquets all the time. So don’t worry about that one! If the racquet breaks, it breaks. But they do last a long time. Do you remember what grip size was on his racquet? It seems that he was switching between 4 1/2 and 4 3/8 several years ago, but no confirmation what he’s using now. I believe he also uses a leather grip and 2 OG’s on top, first OG wrap with no overlap. Yes, it is 3 and he is using two overgrips still. What is his real head size? And the beam? Hello, I like your post and follow frenqutly. I would love to know that if you can compared this racquet to the following racquets I have been using for a while.. I am a comfort, touch , feel and control oriented player with semi western forehand and one-handed back hand….. I do love the comfort , touch and feel from ProKennex which I could not get it from phantom pro 100 even though it has lower flex than Redondo, that is kinda wired to me. ( maybe I use full poly for pro 100 while hybrid for Redondo ). I think I would love to give pro 100 a try after change the strings. Textreme tour 95 feel hollow after I hit those three racquets..
How do you feel about these racquets to PT113B… what is the flex after stings and how you feel about it? I would love to stick to one racquet maybe PT113B….. Thank you for your help…. Those are all good racquets! If you want a similar flex to the PT113B, I would say the Redondo 98 MP comes closest from the bunch. My favorite of them all is probably the 93P, because it suits my game, but they’re all nice sticks. I think the Phantom Pro 100 is not the perfect racquet for my game because of the large head size and shape. It makes it more sluggish than the rest. The Tour 95 needs some lead tape to really shine. The Redondo is all about creating your own power as it does not give you much for free. However, the feel is very nice. I actually miss that one as I sold it. The PT113B is not a magic stick by any means. It plays very nicely but like most 95 sq inch racquets (or smaller) it needs a weight above 345 grams to offer a better power level and stability. I don’t think the PT113B is worth the kind of money it costs as there are other flexible racquets on the market that play really well. I am about to test the Donnay Pro One 97 Hexacore soon. I have high hopes for that racquet. When I hit with it about a month ago it really had a nice feel to it. Superb post and great hitting ! From memory do you know roughly whether the beam width of that PT113B constant or tapered? Some post on tennis warehouse mentioned the old djokovic moulds have slightly wider throat than the tip and head. The beam was constant, very similar to the LM Radical Tour although without the ridges. Djokovic does prefer a bit stiffer hoop, yes.